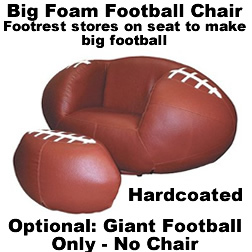 Big Football / Football Chair Prop - Dino Rentos Studios, INC.
Looks like a giant football when all together. Approximately 6 foot wide by 36" tall and 36" deep. Remove the foot rest and place on the floor. The football turns into a chair. Can be ordered a a solid big football foam prop only.